A man who set a car on fire and stabbed three people — one fatally — in the Australian city of Melbourne has died in hospital after being shot by police. The two survivors are in hospital, one in a suspected critical condition. The suspect has not been named. 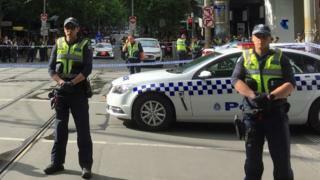 "We are now treating this as a terrorism event," said Victoria Police Chief Commissioner Graham Ashton.